Cutting edge Ice Carving Entertainment . Non-stop action and excitement! 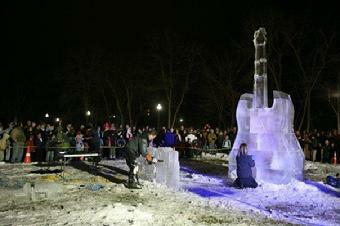 Ice shows are high intensity, fast paced ice carving to music. One, two, or three sculptors will work together to carve a multi block sculpture that will tower up to 8 feet tall in 30-45 minutes! With chainsaws screaming and ice flying, speed and precision are used to create works of art in minutes! A unique show every time with lots of audience participation. EXTREME I.C.E. is guaranteed to be the coolest show on earth. We perform these shows at summer festivals, winter carnivals, state fairs, grand openings, trade shows, charity events, birthdays etc. Many packages are available and they can be customized to fit any event, theme, or budget. 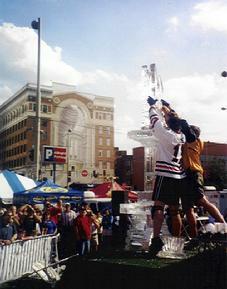 Demonstrations on ice sculpting will last for one hour. In that hour, one block of ice will be sculpted in the design you choose. 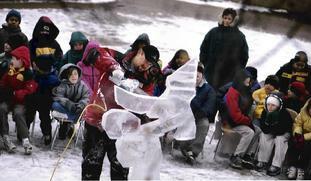 Commentary will be given on carving procedures and a brief history of ice carving. The audience will be amazed at how fast a beautifully detailed ice sculpture can be created in front of their eyes! 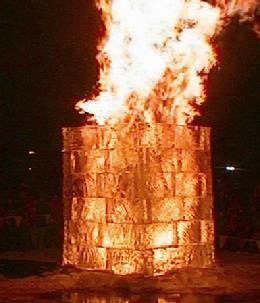 Demonstrations are great for holiday events, grand openings, trade shows and summer or winter festivals. Please call or e -mail for details on pricing.